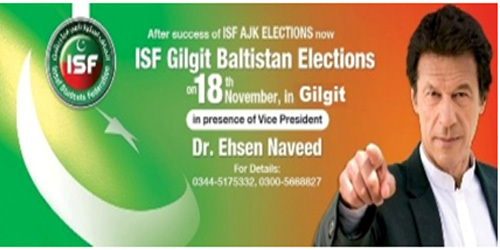 Insaf Student Federation (ISF) will hold its internal elections in Gilgit-Baltistan on 18th November 2012. An independent election commission has been established to conduct free, fair and transparent election, upholding principles of democracy in its true letter and spirit. Central Vice Presdent ISF Pakistan Ehsen Naveed will oversee the entire process and make sure strict implementation of all election rules, regulations and procedures during the elections. “ISF GB election will be a landmark in politics of Gilgit-Baltistan, as it will provide the youth of region with training, learning, and preparation for the future challanges. The forum will bring young minds belonging to different regions, sects, ethnicities ang languages under one umbrella, synergizing their talents and skills for betterment of people of Gilgit-baltistan”, said Imtiaz Ali, a member of ISF. He mentioned the process would provide the youth a forum to voice against constitutional orphanage, poverty, illiteracy, unemployment and diseases and other issues in the region in an organized and peaceful way. All the youth have been urged to become members and play their role in making Gilgit-Baltistan, a democratic, peaceful, developed and educated region of Pakistan.